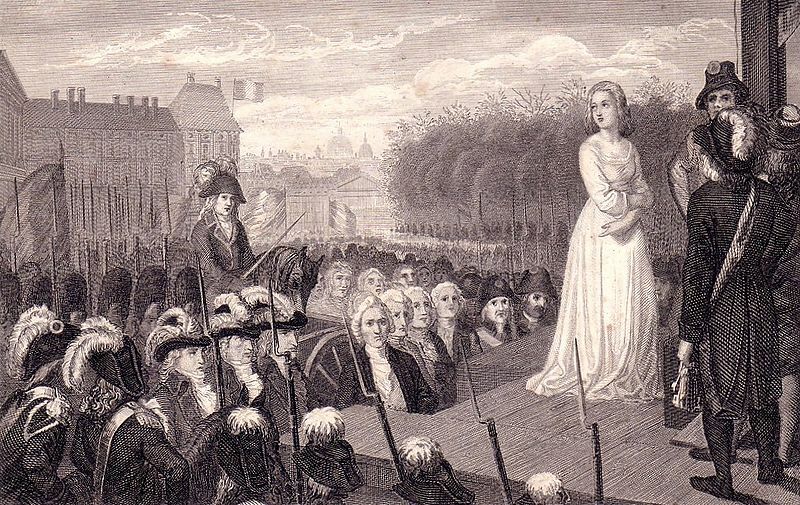 Before we begin the frivolities of the weekend, I thought it important to remember that tomorrow, October 16th , at 12:15 p.m. marks the 217th anniversary of this great woman’s murder. There are two anniversaries on the annual calendar that upon my ritual reading of the events causes my heart to ache. 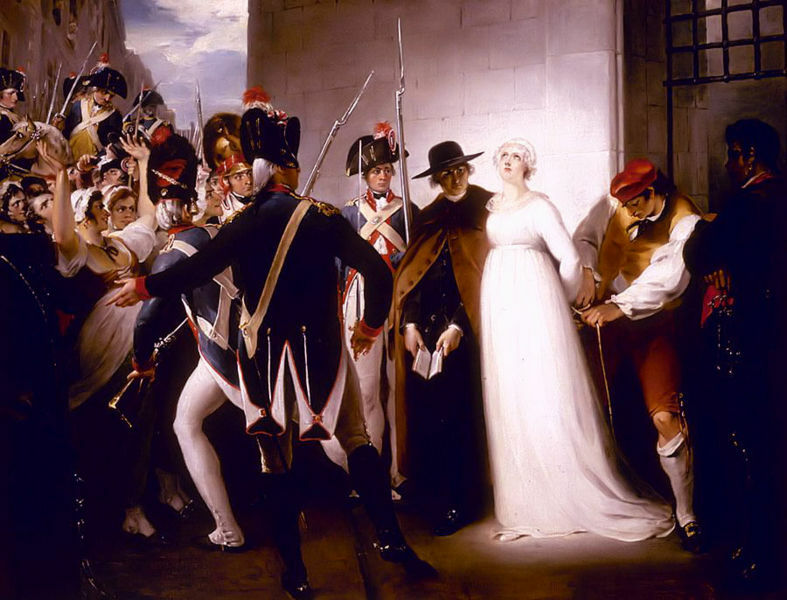 The first being the reading of the Passion , the second being the cruelties inflicted upon Marie Antoinette that October morning 1793. Faith and politics aside, both illustrate man’s ability to disregard humanity , particularly shocking when faced with another who has been reduced to abject wretchedness. My great hope is that I would rise above such base behavior, but even Peter found strength elusive. I love this image of the Queen by Alexandre Kucharski (ca. 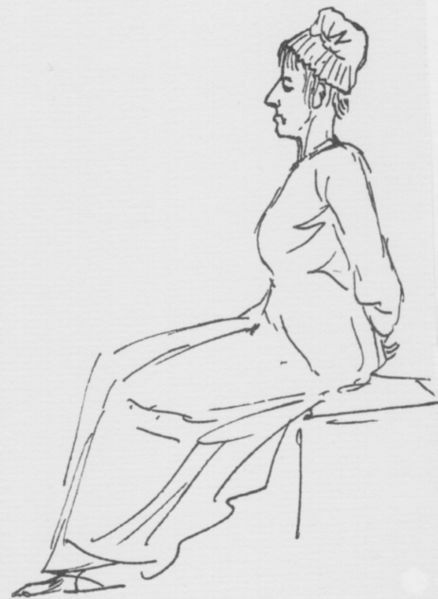 1791). It expresses a great humanity, unlike so many of the “glamour” shoots which we are most familiar with. The softness of her coloring, the luminous quality of her skin prompting Vigée Le Brun to comment that the Queen’s skin “so transparent that it allowed no shadow,”. As much as I may admire the subtle humanity captured by Kucharsky, we have all fallen for her royal public image. or a fashion spread, few have been able to ignore her charms ; save for humorless republicans and godless anarchists. To our very day, folks who share a love of glamour, romance, and style find inspiration in the Martyr Marie. My dear friend Patrick Ediger of the design house French American has wittily designed a new fabric due out this winter. It has been dubbed Queen of Pop, I am particularly attracted to the “chandelier” head dress. As an aspiring artist I am particularly touched by Vigée Le Brun’s remembrance of an awkward moment before the Queen. 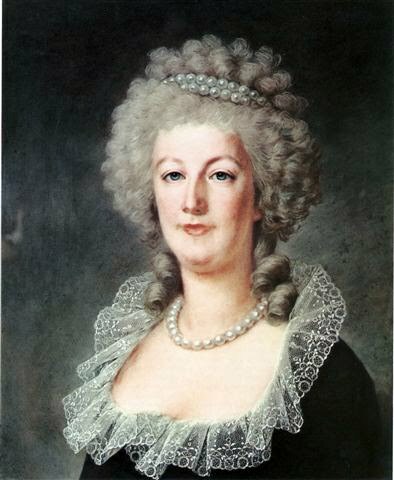 After having cancelled a sitting with the Queen due to illness, Le Brun went to apologize the next day ;the Queen graciously cancelled her own scheduled plans for an impromptu sitting. The Queen’s kindness caused Le Brun to fumble . Le Brun, a favored and ridiculously prolific court painter, remained true to the memory of Her Majesty. Her allegiance complicated matters when the upstart Napoleon sat upon the republican throne. If interested her fascinating memoir is easily downloaded. 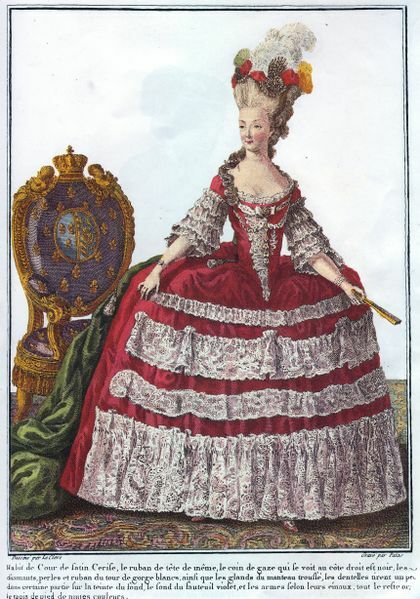 Denying the Queen the dignity of Widows Weeds, “Antoinette Capet”was forced to wear a common white dress. The trip to the guillotine was designed to be a trail of humiliation. The Queen would defy their base intentions. The hateful David took pleasure in depicting the Queen in her final humiliating moments. 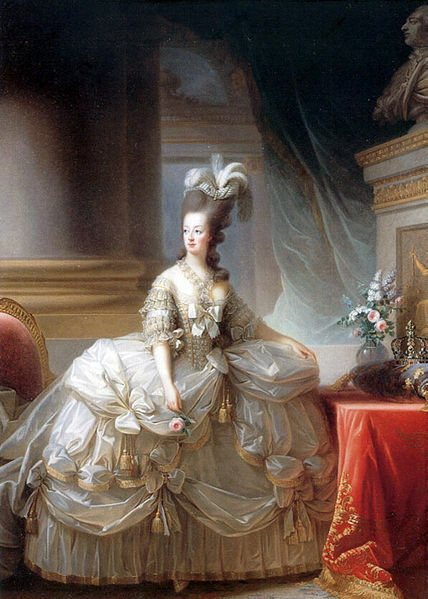 Her critics saw imperial Hapsburg haughtiness, justification for their cruel perversions; I see a woman of great breeding, brutally shorn of hair, a sad cap with a few black ribbons of morning, a body and spirit broken, forced to sit in a donkey cart. Willful hatefulness only elicited dignity from this great Queen. Final sketch by the odious David. Her breeding and innate kindness apparent even as she approached the blade. Having stepped upon her executioner’s foot, she instinctively apologized, ” I did not do it on purpose”. For all of her perceived “sins” that is perhaps a fitting response. True to the Catholic faith , she chided the false priest Abbé Girard when he suggested she gather her courage. This great Queen , daughter of the great Empress Maria Theresia did not require this traitor’s words of encouragement. Much of her reputation has been restored, aside from the tiresome”cake” references, many folks hold a tender place in their hearts for this unfortunate woman. Her final resting spot, the Basilica of Saint-Denis. 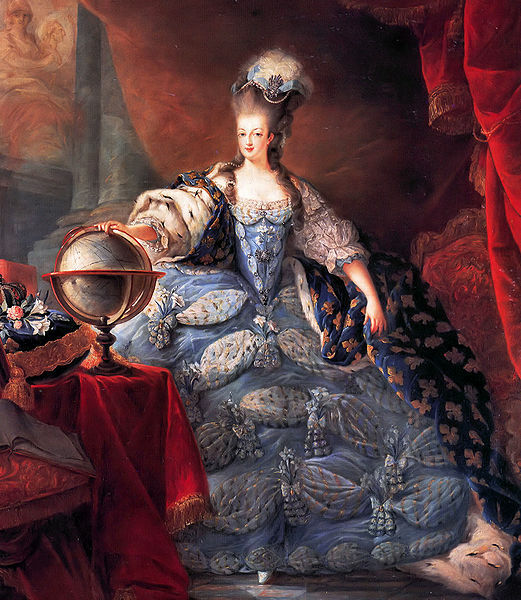 So tomorrow, no matter what your time zone, a t 12:15 pm give a “shout-out ” to dear Marie Antoinette. 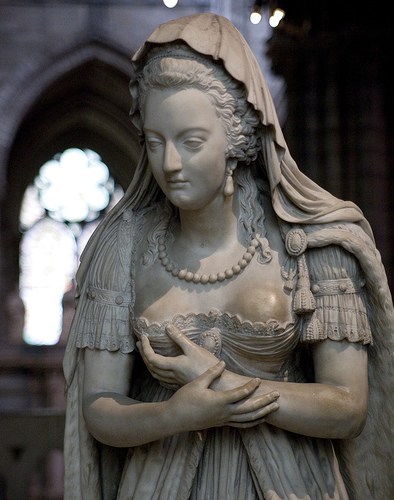 This entry was posted on October 15, 2010 at 10:06 am and is filed under 18th century, Basilica of Saint-Denis, Bourbon monarchy, French-American, Jacques Louis David, Kucharski, Marie Antoinette, R.I.P., Vigee Le Brun. You can follow any responses to this entry through the RSS 2.0 feed. You can leave a response, or trackback from your own site. I so enjoy all your sumptuous posts but as a fan of “the Austrian”, this especially touched me. And what a saucy and thoroughly contemporary portrait of Le Brun! Yes, Viva la Reine indeed! From your blog, which I look forward to reading more thoughtfully, I see you are Southern Californian based. Nice to know a fan of Marie is close at hand. Oh, I’m happy to hear that. Yes LeBrun looks both saucy and adorable. And before noon as well, even though that doesn’t apply in this situation! 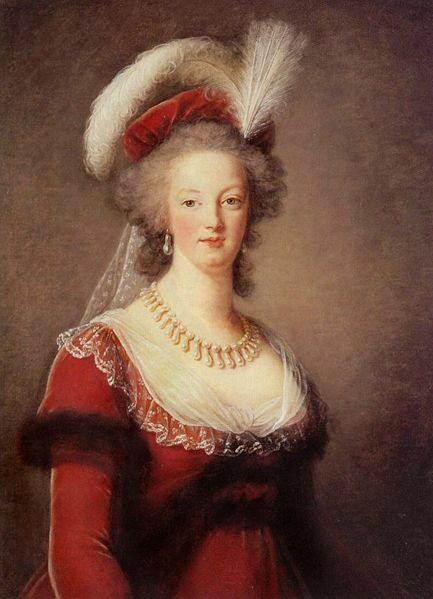 Thank you for this lovely tribute to Marie-Antoinette. I’ve just ordered Antonia Fraser’s book. 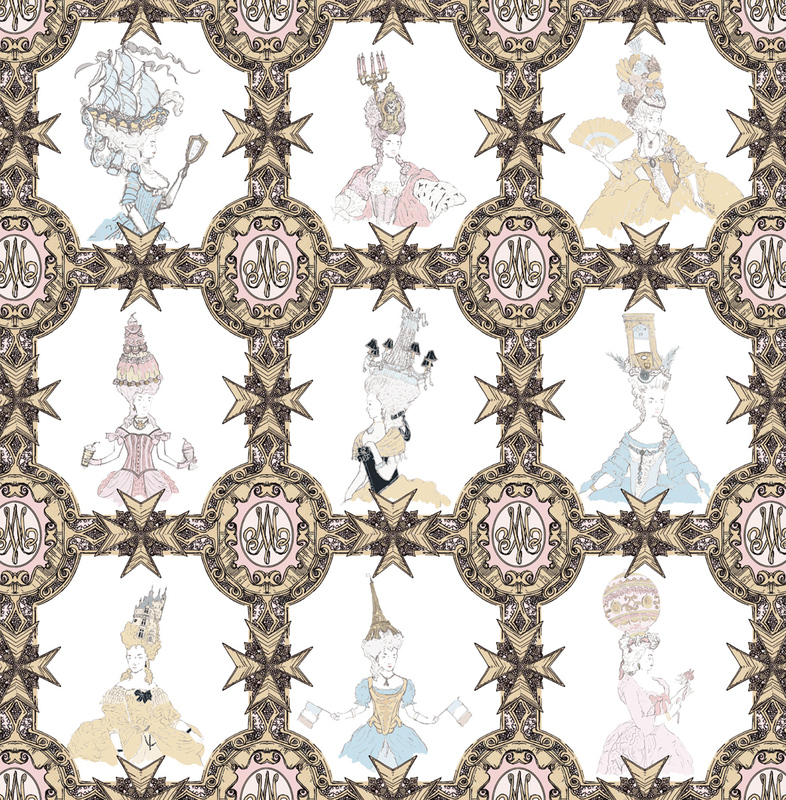 Love the Queen of Pop fabric and the head-dresses; particularly the candelabra and clock and the clipper! oh good, it’s a great read. And yes my chum Patrick is a talented designer. I peeked at your blog, unfortunately this Wagnerite doesn’t know a lick of German. How strange. Who knew there were so many royalists in America. Perhaps we could ship out what’s left of them in Europe (I’m afraid it will be the bottom of the barrel), and for a small fee they can be yours for keeps, as we clearly don’t need them anymore. now now John, it is one thing to be annoyed at costly puppets , another thing altogether to lop off their heads. It is easy being a monarchist when you haven’t the need to really deal with the costs. Just found your blog through Kendra’s. love it, you are now on my blogroll to be savored.. So happy you enjoyed the entry, please continue to follow. Plan to follow up our dear MA with more macabre for Halloween. Kendra, & her blog Porcelains and Peacocks, a dream.